Gallia Academy junior Ashton Webb (11) spikes the ball in front of teammate Taylor Burnette (21), during the Blue Angels’ 3-1 win on Thursday in Centenary, Ohio. CENTENARY, Ohio — One of the Blue Angels’ winning streaks has ended. The other, however, is still alive and well. 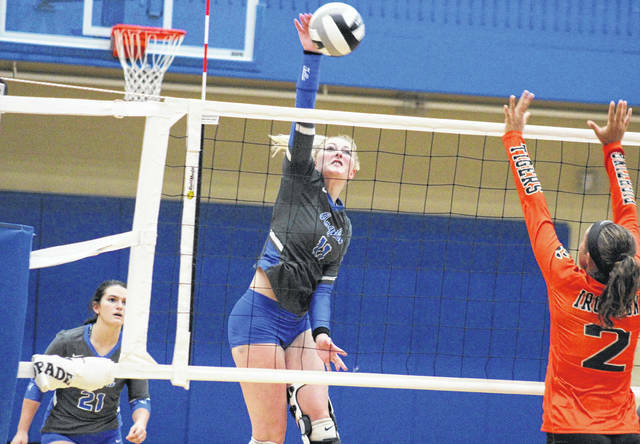 The Gallia Academy volleyball team won its 26th consecutive Ohio Valley Conference match on Thursday in Gallia County, defeating Ironton by a 3-1 count after dropping the first game to the Lady Fighting Tigers. That Game 1 loss ended the Blue Angels’ streak of 75 straight league games won, as GAHS hadn’t lost a single game in the OVC since Oct. 12, 2015 at Portsmouth. In the opening game, Gallia Academy (18-1, 11-0 OVC) fell behind by seven points before taking the lead at 10-9. 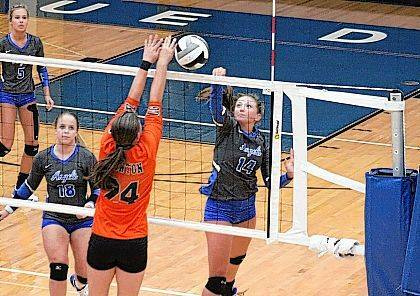 However, Ironton scored the next four points and led the remainder of the way to a 25-19 win. 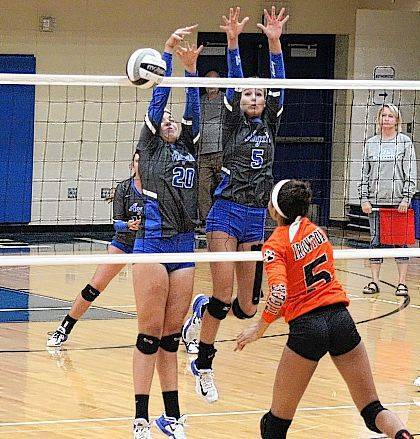 The Blue Angels bounced back in a big way, leading by as many as 15 and never trailing on their way to a 25-12 victory in Game 2. The Lady Fighting Tigers scored the first point of the third game, but surrendered the next five and never regained the advantage. GAHS claimed the third game by a 25-12 count, with the final margin of 13 as the hosts’ largest lead of the stanza. Gallia Academy saved its best for last, leading wire-to-wire en route to the match-clinching 25-5 victory. The Blue Angels’ service attack was led by Alex Barnes with 18 points, including a match-best seven aces. 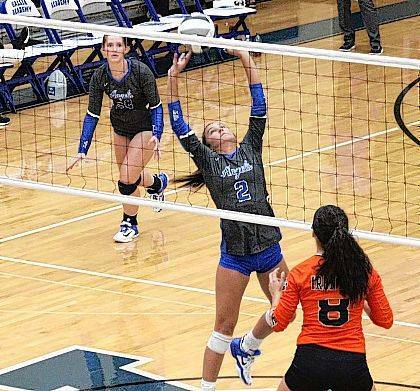 Hunter Copley collected 10 points and three aces for the victors, while Ryelee Sipple and Taylor Burnette marked nine points each, including four and two aces respectively. GAHS junior Katie Carpenter contributed eight points to the winning cause, while Ashton Webb and Peri Martin each had five points, including three aces by Webb and two by Martin. Webb led the hosts at the net with 19 kills and three blocks, followed by Martin with nine kills and a team-best 33 assists. Copley posted eight kills in the win, Barnes added six kills and one block, Aubrey Unroe came in with four kills, while Maddy Petro chipped in with one kill and one block. Copley led the Blue and White on defense with a 10 of the team’s 43 digs. Lexi Wise and Ali White led Ironton with seven service points apiece. Mckenzie Cremeens had five points in the setback, Samantha LaFon and Peighton Rowe added three apiece, while Riley Schreck had a pair of points for the guests. Gallia Academy also defeated IHS on Sept. 7 in Lawrence County. The Blue Angels continue league play on Monday at Portsmouth.